Indian Martial Arts refers to a cluster of religious and martial practices that arose in the Indian subcontinent beginning in Vedic times (c. 1500-700 B.C.E.). Vedic literature includes a field of study known as Dhanurveda (from dhanus "bow" and veda "knowledge"), which developed into an important component of ancient Hindu society. This "science of archery" included armed and unarmed combat, and aspects such as meditation and mental conditioning. The theories behind Yoga, Ayurveda and Tantra, such as Kundalini (coiled energy), Prana (life force), Nadi (meridians), Chakra (aura) and Marmam (pressure points), are also present in Indian martial arts. Although many Hindu saints have championed non-violence in modern times, it is also true that many ancient Hindu temples have statues of deities and warriors in various postures related to combat. It is also true that The responsibility for the practice of Indian martial arts fell to the hands of the Hindu Kshatriyas (warrior caste). furthermore, a number of ancient Dravidian martial arts were developed in South India, including Kuttu Varisai (empty hand combat) and Varma Kalai (the art of vital points) in Tamil Nadu, and Kalarippayattu (way of the arena) and Adithada (attack and defend) in Kerala. The Vishnu Purana text describes Dhanur Veda as one of the traditional eighteen branches of knowledge. The Indian epics contain accounts of combat, describing warriors such as Bhima. The Mahabharata describes a prolonged battle between Arjuna and Karna using bows, swords, trees and rocks, and fists. Another unarmed battle in the Mahabharata describes two fighters boxing with clenched fists and fighting with kicks, finger strikes, knee strikes and headbutts. Other boxing fights are also described in Mahabharata and Ramayana. Stories describing Krishna report that he sometimes engaged in wrestling matches where he used knee strikes to the chest, punches to the head, hair pulling, and strangleholds. Based on such accounts, Svinth traces press ups and squats used by Indian wrestlers to the pre-classical era. Many authorities contend that the fourth century B.C.E. conquest of India by Alexander the Great laid the foundation of Indian martial arts by dispersing pankration techniques throughout the subcontinent. Around the third century B.C.E., Patanjali wrote the Yoga Sutras, which taught how to meditate single-mindedly on points located inside one's body, which was used in later martial arts, while various mudra finger movements were taught in Yogacara Buddhism. These Yoga elements, as well as finger movements in the nata dances, were later incorporated into various martial arts. The word "kalari" appears in the Puram  and Akam  to describe to both a battlefield and combat arena. It is also mentioned in Sangam literature from the second century B.C.E. The Akananuru and Purananuru describe the martial arts of ancient Tamilakkam, including forms of one-to-one combat, and the use of spears, swords, shields, bows and silambam. 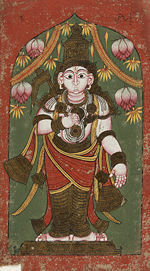 The references to "Silappadikkaram" in Sangam literature dating back to the second century refer to the sale of Silamabam staves, swords, pearls and armor to foreign traders. The silambam staff was one of the martial art weapons, which was in great demand with the visitors. References to martial arts are found in early Buddhist texts. The Lotus Sutra (ca. first century C.E.) refers to a boxing art while speaking to Manjusri. Other stories suggest that Siddhartha Gautama was a champion of martial arts and archery before becoming the Buddha. Another early Buddhist sutra Hongyo-kyo describes a "strength contest" between Gautama Buddha's half-brother Prince Nanda and his cousin Devadatta. The martial art of Vajra Mushti is also mentioned in sources of the early centuries C.E. Like other branches of Sanskrit literature, treatises on martial arts became more systematic in the course of the first millennium C.E. Indian military accounts of the Gupta Empire (c. 240-480) identified over 130 different classes of weapons. The Kama Sutra written by Vātsyāyana at the time suggested that women should regularly "practice with sword, single-stick, quarter-staff, and bow and arrow." The Sushruta Samhita (c. fourth century) identifies 107 vital points of the human body in his Sushruta Samhita. Of these 107 points, 64 were classified as being lethal if properly struck with a fist or stick. Sushruta's work formed the basis of the medical discipline Ayurveda, which was taught alongside various Indian martial arts that had an emphasis on vital points, such as Varma Kalai and Marma Adi. With numerous other scattered references to vital points in Vedic and epic sources, it is certain that India's early martial practitioners knew and practiced attacking or defending vital points. Martial arts were not exclusive to the Kshatriya warrior caste, though they used the arts more extensively. The eighth century text Kuvalaymala by Udyotanasuri recorded martial arts being taught at salad and ghatika educational institutions, where Brahmin students from throughout the subcontinent (particularly from South India, Rajasthan and Bengal) "were learning and practicing archery, fighting with sword and shield, with daggers, sticks, lances, and with fists, and in duels (niuddham)." Around 630 C.E., King Narasimhavarman of the Pallava dynasty commissioned dozens of granite sculptures showing unarmed fighters disarming armed opponents. These may have shown an early form of Varma Adi, a Dravidian martial art that allowed kicking, kneeing, elbowing, and punching to the head and chest, but prohibited blows below the waist. This is similar to the Dhanur Veda martial art described in the Agni Purana. 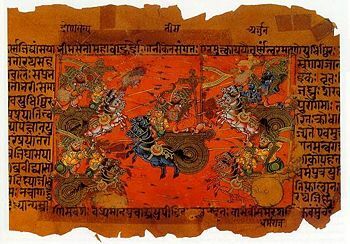 The earliest extant manual of Dhanur Veda is in the Agni Purana (c. eighth century), which contains several chapters giving descriptions and instructions on the fighting arts of Dhanur Veda, with reference earlier sutras on Dhanur Veda dating back centuries earlier. It described how to improve a warrior's individual prowess and kill enemies using various different methods in warfare, whether a warrior went to war in chariots, elephants, horses, or on foot. Foot methods were subdivided into armed combat and unarmed combat. The former included the bow and arrow, the sword, spear, noose, armour, iron dart, club, battle axe, discus, and the trident. The latter included wrestling, knee strikes, and punching and kicking methods. Organized martial arts in ancient India include the martial art of Malla-yuddha, a form of combat wrestling codified into four forms. The Malla Purana (ca. thirteenth century) is the earliest treatise discussing the techniques of Malla-yuddha. The modern forms of Marma Adi, Varma Ati, and Kalarippayattu were developed by the eleventh century, during an extended period of warfare between the Chera and Chola dynasties. Kalarippayattu underwent a period of decline after the introduction of firearms and especially after the full establishment of British colonial rule in the nineteenth century. 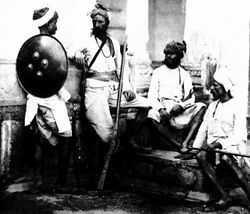 More European modes of organizing police, armies and governmental institutions, and the increasing use of firearms, gradually eroded the need for traditional martial training associated with caste-specific duties. The British colonial government banned kalarippayattu in 1804 in response to a series of revolts. The resurgence of public interest in kalarippayattu began in the 1920s in Tellicherry as part of a wave of rediscovery of the traditional arts throughout South India, which characterized the growing reaction against British colonial rule. According to P. C. Chakravati in The Art of War in Ancient India, Indian armies used standard weapons such as wooden or metal tipped spears, swords, thatched bamboo shields, wooden shields, metal shields, axes, short bows and long bows in warfare as early as the invasion of India by the forces of Alexander the Great, and these weapons are all mentioned in even earlier native texts. Some troops in ancient times wore personal armor, but the majority did not until medieval times. Armed forces were largely standardised, and it is unclear if regular infantry were trained in any recognisable Indian martial art, other than standard military drills. Over time, weapondary evolved, and India became famed for its flexible wootz steel. Invasion in the thirteenth century from the pourous northwestern mountain passes that lead from Cerntal Asia and the Middle East into India, likely inspired new forms of weapondary, such as the talwar, a curved blade resembling Persian and Turkic arms. Curved blades had been used in India since ancient times, some even curved toward the cutting side like a sickle, but before the introduction of the talwar, the stright khanda type sword may have enjoyed greater popularity. 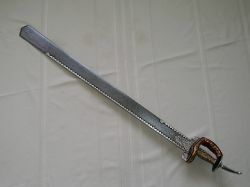 Martial artists, typically coming from warrior jatis, employed other uniquely weapons such as the katar sword-gauntlet and urumi sword-whip. The martial arts of India have influenced the martial arts of other countries, particularly within the Indosphere, those regions outside India influenced by Indian culture. Examples of such arts include Bando, Silat, Escrima, and Muay Thai. The Tamil kingdoms were instrumental in the spread of Silambam throughout Southeast Asia. During the 18th and the 19th centuries, Silambam was much more prevalent in Southeast Asia than in India, where it was banned by the British government. India has also influenced the Portuguese martial art of Jogo do Pau. The practice of Indian clubs swinging was first introduced to England by British soldiers who had studied the discipline while stationed in India during the 1800s. The Indian clubs were used by military cadets and appeared as a gymnastic event in the 1904 Olympics. Gymnasiums were built just to cater to club exercise groups. Russian officials traveled to India, under the employ of NKVD (the leading secret police organization of the Soviet Union) physical training center, "Dinamo", to observe its native martial arts. The collection of techniques from martial arts of various countries—including India—formed the basis of the Russian martial art Sambo. V.A. Spiridinov was assigned to Mongolia, China and India to research the Mongol-Vedic martial arts. Doshin So, the founder of Shorinji Kempo, was convinced that a Shaolin temple wall painting depicted Chinese and Indian monks practicing martial arts together for spiritual edification. ↑ 1.0 1.1 D.H. Luijendijk, Kalarippayat: India's Ancient Martial Art (Paladin Press, 2005, ISBN 1581604807). ↑ 2.0 2.1 2.2 2.3 Phillip B. Zarrilli, A South Indian Martial Art and the Yoga and Ayurvedic Paradigms. Retrieved August 19, 2016. ↑ Section XIII: Samayapalana Parva, Book 4: Virata Parva, Mahabharata. Retrieved August 30, 2016. ↑ Shamya Dasgupta, "An Inheritance from the British: The Indian Boxing Story," Routledge 21 (3)(June-September 2004): 433-451. ↑ 5.0 5.1 5.2 5.3 5.4 5.5 5.6 5.7 5.8 5.9 J. R. Svinth, A Chronological History of the Martial Arts and Combative Sports. Electronic Journals of Martial Arts and Sciences, 2002. Retrieved August 30, 2016. ↑ Jim Arvanitis, Pankration (Paladin Press, 2003, ISBN 978-1581603972). ↑ 7.0 7.1 Tank Todd and James Webb, Military Combative Masters of the 20th Century (Lulu.com, 2006, ISBN 978-1411661967). ↑ verses 225, 237, 245, 356. ↑ verses 34, 231, 293. ↑ J. David Manuel Raj, The Origin and the Historical Development of Silambam Fencing: An Ancient Self-Defence Sport of India (Oregon: University of Oregon, 1977). ↑ 11.0 11.1 11.2 Bruce A. Haines, Karate's History and Traditions (Tuttle Publishing, 1995, ISBN 0804819475). ↑ G. D. Singhal and L. V. Guru, Anatomical and Obstetrical Considerations in Ancient Indian Surgery Based on Sarira-Sthana of Susruta Samhita (India: Singhal Pubns, 1973, ISBN 978-0861860517). ↑ 13.0 13.1 13.2 Phillip B. Zarrilli, "To Heal and/or To Harm: The Vital Spots (Marmmam/Varmam) in Two South Indian Martial Traditions" Part I: Focus on Kerala's Kalarippayattu" Journal of Asian Martial Arts 1(1) (1992). Retrieved August 30, 2016. ↑ P. C. Chakravarti, The art of warfare in ancient India (Delhi, 1972). ↑ 15.0 15.1 15.2 Phillip B. Zarrilli, When the Body Becomes All Eyes: Paradigms, Discourses and Practices of Power in Kalarippayattu, a South Indian Martial Art (Oxford University Press, 2000, ISBN 978-0195655384). ↑ Graham Noble, "The Lion of the Punjab – Gama in England, 1910" InYo: Journal of Alternative Perspectives, May 2002. Retrieved August 30, 2016. ↑ Graham Noble, "The Lion of the Punjab – Part II: Stanislaus Zbyszko" InYo: Journal of Alternative Perspectives, June 2002. Retrieved August 30, 2016. ↑ Graham Noble, "The Lion of the Punjab – Part III: London, 1910" InYo: Journal of Alternative Perspectives. July 2002. Retrieved August 30, 2016. ↑ Graham Noble, "The Lion of the Punjab – Part IV: Aftermath" InYo: Journal of Alternative Perspectives. Aug 2002. Retrieved August 30, 2016. ↑ Joseph Alter, Subaltern Bodies and Nationalist Physiques: Gama the Great and the Heroics of Indian Wrestling Body Society 6(2) (June 2000): 45-72. Retrieved August 30, 2016. ↑ Donn F. Draeger and Robert W. Smith, Comprehensive Asian Fighting Arts (Kodansha USA, 1981, ISBN 978-0870114366). ↑ Donn F. Draeger, Weapons and Fighting Arts of Indonesia (Tuttle Publishing, 2001, ISBN 978-0804817165). ↑ Sheikh Shamsuddin, The Malay Art of Self-Defense: Silat Seni Gayong (Blue Snake Books, 2005, ISBN 978-1556435621). ↑ Mark V. Wiley, Filipino Martial Arts: Cabales Serrada Escrima (Tuttle Publishing). ↑ Arjarn T. Moore, Muay Thai's Divine Connection USMTA Inc. Retrieved August 30, 2016. ↑ Robert Crego, Sports and Games of the 18th and 19th Centuries (Greenwood Press, 2003). ↑ Nuno Curvello Russo, (translated by Tony Wolf and Gonçalo Costa), Jogo do Pau: Origins and Evolution Journal of Manly Arts, February 2003. Retrieved August 30, 2016. ↑ Dio Lewis, "Exercises with Clubs" Physical Training, Nov 2001. Retrieved August 30, 2016. ↑ Rupert A. Cox, Zen Arts: An Anthropological Study of the Culture of Anesthetics Form in Japan (Routledge, 2003, ISBN 978-0700714759). Since his first visit to the Shaolin Temple, Doshin So had been impressed with the wall paintings which depicted Indian and Chinese monks training and enjoying themselves together. This method of training together stood in contrast to his own training, and he developed the idea that training should be a collaboration between partner, for the purpose of mutual progress. In Japanese this concept is expressed as "otagai renshu" (training for each other) or "jita kyoraku" (enjoying things with other people). Chakravarti, P.C. The Art of Warfare in Ancient India. Delhi, 1972. Dasgupta, Shamya. "An Inheritance from the British: The Indian Boxing Story," Routledge 21 (3) (June-September 2004): 433-451. Raj, J. David Manuel. The Origin and the Historical Development of Silambam Fencing: An Ancient Self-Defence Sport of India. Oregon: University of Oregon, 1977. Wiley, Mark V. Filipino Martial Arts: Cabales Serrada Escrima. Tuttle Publishing. History of "Indian Martial Arts"
This page was last modified on 30 August 2016, at 22:29.